Uncover Iceland's modern and forward-looking capital city on this Reykjavik Hop On-Hop Off city tour. Take the entire one hour tour or take as much time as you like to explore any of the route's sixteen stops. The choice is yours. See the Whale Watching Center, the National Museum, and the Perlan. Stops also include Kringlan Shopping Center and other must see destinations around the city. Full commentary aboard your Reykjavik sightseeing tour bus will enhance your appreciation of Iceland's amazing capital city. Enjoy the sight of Reykjavik's stunning Lutheran Church, Hallgrim's Church. As the largest church in Iceland, it stands at a height of 244 feet and is even used as an observation tower. Designed by Iceland's state architect, it is said to have been designed to resemble the lava flows of Iceland's landscape and therefore is unique in its facade among every church in the world. Another stop along the route is the incredible National Museum. Showcasing Icelandic cultural heritage, this museum offers insight into Icelandic life, history, and culture. If you choose to visit the museum, see exhibits that highlight Iceland's professions and way of life, including its homes and settlement patterns, arts, culture, and languages. 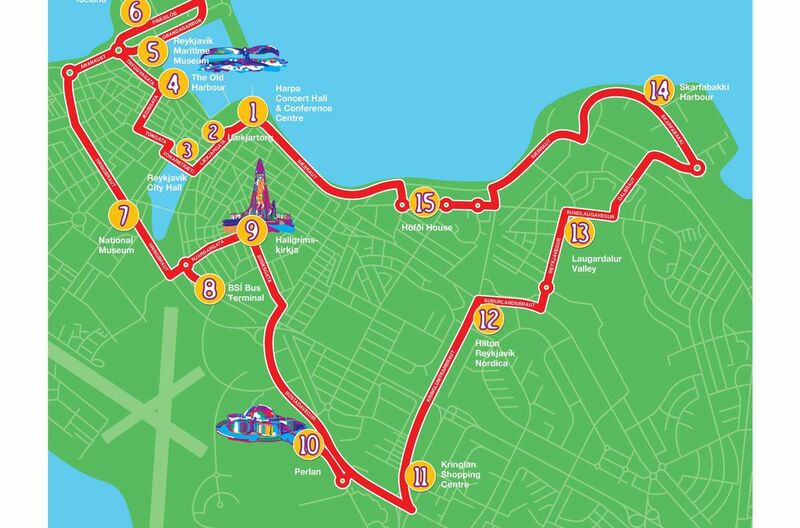 The bus route will also swing by the Perlan and the Kringlan Shopping Center. The Perlan in known for its unique design and observation deck that offers some of the greatest views of the city. Explore the Kringlan Shopping Center, and you will encounter Reykjavik's largest shopping mall with over 170 shops and restaurants. With 24 hours allotted to use your pass, you'll have ample time to explore all of Reykjavik or see the sights that are most important to you. On this Iceland tour you have the freedom to choose your itinerary in order to make the most of your day. Please Note: There are 15 stops on this route and it takes approximately 60 minutes to complete the route without getting off. The bus runs every 30 minutes and the tour is narrated in English, Spanish, German, French, Italian, Swedish, and Icelandic. First and last tour times vary by season and will be detailed in your electronic ticket. This tour is wheelchair accessible. Customers must be able to walk short distances and/or a few steps on their own.